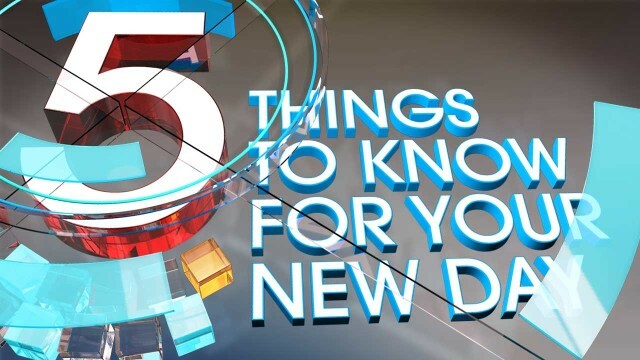 Welcome to the Wednesday edition of “5 Things to Know for Your New Day." Leakers in limbo: Edward Snowden sits in a Moscow airport hotel; Bradley Manning sits in a jail cell. Snowden’s dad told the Washington Post yesterday that the feds wanted to fly him to Moscow to talk his son into coming back to the States. But they couldn’t guarantee that he’d get to speak to Snowden. His response? “I’m not going to sit on the tarmac to be an emotional tool for you.” The dad was on CNN yesterday too, where he told Jake Tapper he wants Snowden to stay in Moscow. He’s not confident of a fair trial, especially after the guilty verdicts in the Manning case. As for Manning, the sentencing phase of his trial begins today. Yesterday, he was found not guilty of the most serious charge – helping the enemy. But he’s still on the hook for 20 other charges – and all of them carry lengthy prison terms. But it’ll take a few days before the judge decides whether Manning should be sent away for years or decades for leaking those military documents to WikiLeaks. CNN senior legal analyst Jeffrey Toobin will join us at 7 about what’s ahead for Manning. Bad greens blamed: Let’s start with the good news: Officials say that prepackaged salad mixes that caused hundreds of people to get a stomach bug are all gone from store shelves in Iowa and Nebraska. But people continue to get sick with cyclospora, which has symptoms like diarrhea and nausea. And people are getting sick in other states too. Is the salad in a bag to blame there also? Great, as if my nieces and nephews need another reason to avoid their veggies. Dr. Sanjay Gupta will have more on the outbreak all morning. Screen the screeners: Sleeping on the job. Stealing our stuff. Giving their buddies a pass. As if the folks who feel us up before we get on an airplane aren’t unpopular already. Now comes this government audit that finds more than 1,900 cases of misconduct by TSA agents. And that’s just the "tip of the iceberg," says a lawmaker. That’s bad, we’ll grant you. But what about the airline worker and his fiancée who took advantage of the chaos after the Asiana crash? They supposedly went through the bags that had stacked up because of delays at the San Francisco airport, stole the stuff they found and took them to Nordstrom for cash refunds. Rene Marsh joins us with a full report on this story. And yet "another woman" is alleging sexually harrassment by San Diego Mayor Bob Filner. Even Tiger Woods says "This guy is out of control!!" At 7, Rosa Flores will have the latest on the controversy with the Weiner campaign. - To hell with the bags:If you were told at the airport your fees for seven bags would be $1,400, what would you do? Well, you wouldn’t have that problem unless you’re named Paris Hilton. But a man going from Seattle to JFK did. And when faced with the big bill, he just ditched four of his bags and took off. Security closed off a section of the ticketing area when the bags were found unchaperoned. That baggage story is pretty funny, but why on earth was the guy trying to bring SEVEN bags onto an airplane? Holy cow. - Right back at ya: A graffiti artist came upon a public worker removing his graffiti from a wall and decided to use the moment as inspiration for his next work … on the same wall. The Daily Mail spoke to the artist who goes by the tag “DS.” DS says he took photographs of the worker man, then returned later to immortalize him in the act. Look, everyone's happy! It's not quite as epic as posing with a tiger a la Vladimir Putin. But Bashar al-Assad has joined Instagram and the photos are propagandastically fantastic. There's al-Assad talking to a little girl by the side of a hospital bed. There's his wife wiping away a little boy's tear. There's the two of them being mobbed, greeted, hugged by adoring masses. - Dash cam: Gone in 60 seconds? That would be generous. A manhunt is on for an inmate who made a bold escape in Garland County, Arkansas, by slithering past prison guards, bolting through a 12-by-30-inch reception window and jumping into a getaway car. And it’s all caught in glorious Technicolor on surveillance camera. And one more. Watch this video where a skateboarder flips from one board to another. It’s amazing. Be sure to tune in to "New Day," from 6 to 9 a.m. ET, join us at CNN.com/NewDay and go and have a GREAT NEW DAY! Is there anything positive you can report that I can start my day with? Why don't you try stepping outside the herd and try something that might inspire people not depress them at the beginning of their day? You just might find something that clicks and gets you more viewers.